Protections for eagle nests have been removed from Juneau’s land use code following action by the Juneau Assembly that came down to a single vote. The old rules created a no-building buffer spanning from 50 to 350 feet from an eagle’s nest depending on the time of year and other factors. Late last year, city staff argued that with too few federal biologists to plot the nest locations, the ordinance had become difficult to enforce. The amendment was made over the objections from some Assembly members. Deputy Mayor Jerry Nankervis brushed off this criticism. 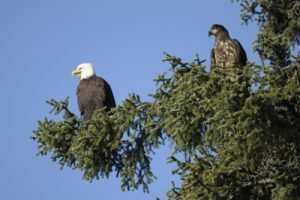 He noted that tree work in recent years near the State Department of Transportation facility near Mile 7 on Glacier Highway seemed to invite even more eagles to roost. “I think if you want to look at eagles, they are still around and in fact, they are taking advantage of some of the activity that our community is engaged in,” Nankervis said. The motion passed 5-4 with Kiehl, Rob Edwardson, Maria Gladziszewski and Loren Jones dissenting. A similar effort to scrap eagles’ nest buffers failed in 2012 following public outcry. No one spoke at Monday’s public hearing.